Am I the only one getting tired of President Obama constantly berating his political opponents and accusing them of being bought? 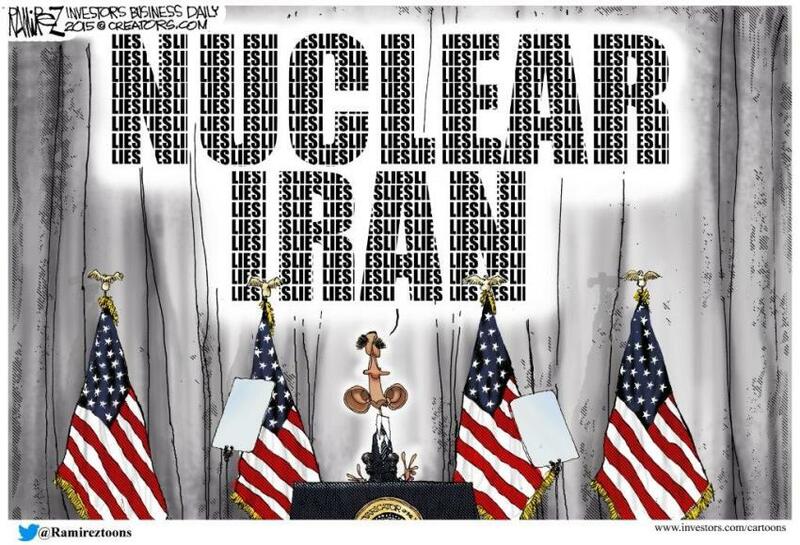 Well, he is doing it again, on his Iran nuke deal. You can always tell when Obama is nervous about a policy proposal, because he won’t stop talking about it. As disturbing as Obama’s militant partisanship is, what’s worse is his delusional perception that anyone who disagrees with him is automatically unreasonable and corrupt. Such is the world of an egotistical narcissist. If you resist Obama, you are crooked, because those free of corrupting influences grasp the superior wisdom of his ideas. He’s the true bipartisan, and both parties would adopt his ideas if they cared about the national interests. As such, he is justified in mistreating his opponents as shady partisan obstructionists. I know, I know. Many of you think Obama’s not self-deluded, that he knows he is militantly partisan and this is just his Saul Alinksy act to target, isolate and demonize opponents — and to lie with abandon to accomplish his agenda. I’m partially with you, but this is a false choice. Obama is Alinsky’s best pupil; he knows exactly what he’s doing when he lies to advance his ideas, but he also believes his own propaganda. He is so enamored with himself and so intoxicated with his transformational agenda that he believes his way is the only way — and that’s scary. But now, back to his lies on the Iran deal. You see — the deal’s opponents couldn’t conceivably persuade a majority of Americans and Congress without millions in deceptive advertising sponsored by rich, racist corporations who hate the homeless. But if the deal is so great, why is he the one charging to the podium to promote it, just as he did with Obamacare? Polls show Americans oppose it, so he’s launched a desperate campaign to salvage it, which, I dare say, will not only be financed by his deep-pocketed allies, but also fueled by his free, megawatt presidential bully pulpit. Obama claims this is America’s strongest ever arms deal. Yes, just like his economy is booming and real unemployment is falling. How can he brag about a deal that won’t prohibit Iran from developing nuclear weapons and will likely accelerate the process in the long term? He claimed we had to reach a deal with Iran because the only other option is another war in the Middle East. Nonsense. The chairman of the joint chiefs, Martin Dempsey, disputes this, saying, “We have a range of options” other than accepting Obama’s deal and going to war with Iran. When questioned by Sen. Joni Ernst, R-Iowa, on whether he told Obama war was the only other option, Dempsey said, “No, at no time did that come up in our conversation, nor did I make that comment. … I can tell you that we have a range of options, and I will always present them.” Is Obama going to claim some evil corporation is paying Dempsey to say this? Obama always manufactures crises to advance his unpopular ideas. Yes, the idea of Iran getting nukes is crisis-worthy, but not the way Obama frames it. Our sanctions were working, which is the only reason Iran came to the table. By showing Iran his anxiousness to drop sanctions to secure some legacy-enhancing deal, he forfeited our negotiating leverage from the beginning. Obama’s arrangement lifts the punishing sanctions that were weakening Iran’s nuclear aims and impairing its sponsorship of global terrorism in exchange for a Hail Mary chance that the deal will stall Iran’s nuke designs. It gratuitously releases billions of dollars back to Iran for funding terrorism and proxy wars around the world. The only chance this deal has of working is if Iran stands down on its own (as it chants “death to America; death to Israel”) or the inspections work. But the inspections process is so flawed and America’s role in it so limited that it’s hard to believe any American president would so betray our national security interests. Obama’s opponents are not the ones organizing a false advertising campaign. He is. His opponents are not the ones “making common cause with” Iran’s hardliners as he charged. He is. The hardliners and Obama are stewing in their mutual elation. Perhaps Obama’s biggest whopper, however, is his claim that if Congress rejects the deal America will lose credibility as the anchor of the international system. No, if this deal goes through, America will continue to decline in the eyes of a world craving leadership against evil — and in reality.